Belle Rock Exclusive Slot Guide & Review - Casino Answers! Belle Rock is a 5-reel, 9-line video slot developed by Microgaming, featuring wild symbols, scatter wins, multipliers, free spins and a gamble feature. 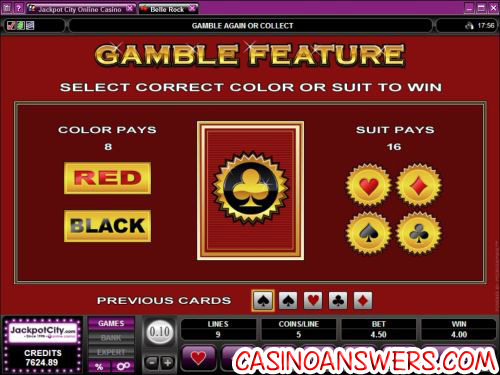 It is an exclusive game to online casinos in the Belle Rock Group, such as Lucky Nugget Casino and River Belle Casino. The symbols in the Belle Rock video slot mostly revolve around the casinos in the group – Jackpot City Casino and Gaming Club Casino in addition to the ones already mentioned. In addition to these, there are also casino symbols such as a casino chip, cards and roulette wheel and Ace, King, Queen and Jack symbols. To play the Belle Rock video slot game, set your coin size at one of the following values: $0.01, $0.02, $0.05, $0.10, $0.20, $0.25, $0.50, $1 or $2. Now, you can also set the number of active paylines (up to 9) and the number of coins per line (up to 5). The lowest total bet you can make on the Belle Rock slot machine is a penny, while the highest total bet is $90. This is a good betting range that should suit any slots player. When you’re ready to play, you can hit the “Bet Max” button for all 9 lines and 5 coins per line or just use the “Spin” button. The Belle Rock Entertainment wild symbol is the top jackpot. Five of these symbols will pay out 10,000X your total bet. The symbol also acts as a wild symbol and will substitute for all symbols in the game except for scatters. While substituting as a wild symbol, it will also act as a multiplier and double your winnings. If you hit three, four or five scatter symbols anywhere on the reels, you will win 15 free spins with a 3X multiplier. All of your winnings will be tripled during the free spins feature. You can re-trigger free spins during the feature. All bets and lines played are the same that triggered the feature. Scatter wins are added to payline wins. Belle Rock has an autoplay mode where you can set the number of spins, number of seconds between spins, to stop once all spins are complete, stop when the jackpot is won, stop if a win exceeds or equals (from $25 to $2500), stop on any win, stop on free spin feature, stop if credits increase or decrease (from $25 to $2500). There is also an autoplay option for the gamble feature. In the gamble feature’s autoplay mode, you can set it to stop if the win exceeds or equals (from $25 to $2500), stop after a number of consecutive gambles or to gamble until a win exceeds or equals (from $25 to $2500). You can set it to choose the colour (random, red or black) or suit (random, hearts, diamonds, clubs or spades). You can cancel the autoplay mode at any time. 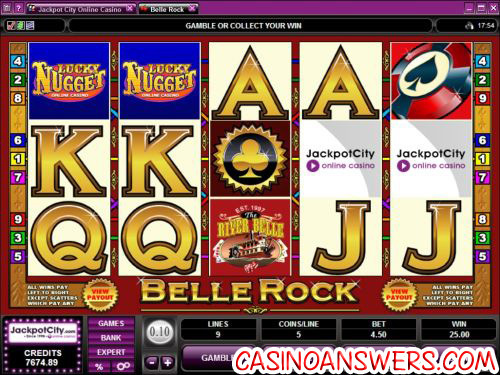 To play the Belle Rock video slot, visit one of the Belle Rock casinos, such as Lucky Nugget Casino. At Lucky Nugget, you will get one hour with $1000 to play on 400 different casino games for free! To try out Belle Rock and 400 other games for free, sign up at Lucky Nugget Casino! How come I can’t find Belle Rock at this Microgaming casino? Belle Rock is an exclusive video slot to online casinos in the Belle Rock Entertainment Group. To play the Belle Rock video slot, you must sign up at one of the Belle Rock online casinos, such as Lucky Nugget Casino and River Belle Casino.